The TARDIS is running low on Artron energy and the Doctor needs your help. Step aboard and travel through time and space trying to be the first player to reach the water tower refuelling station in the centre of Cardiff. Sounds easy... but not when the evil Dalek Caan is roaming the universe trying to EXTERMINATE you!! 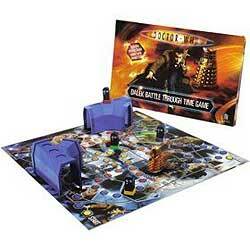 In this fast paced action game, with moving Dalek model with rotating turret and sound FX!, race your TARDIS around the board being pursued by Dalek Caan. As you journey through the past, present and future, Dalek Caan is relentless and never far away. He could emerge from one of the 3D time portal tunnels and be on your trail at any time! !